If jumping off of things has been your fascination then Felix Baumgartner may not be a name you are unfamiliar with. Neither are you unfamiliar with his sky diving feet that left the world baffled with the extent to which we test our limits. But seriously to answer the question about how to break the sound barrier with the body, hint- it is by jumping off the stratosphere. And if you are not in the position to just fathom how high the stratosphere really is, well here is an info graphic that does just that. 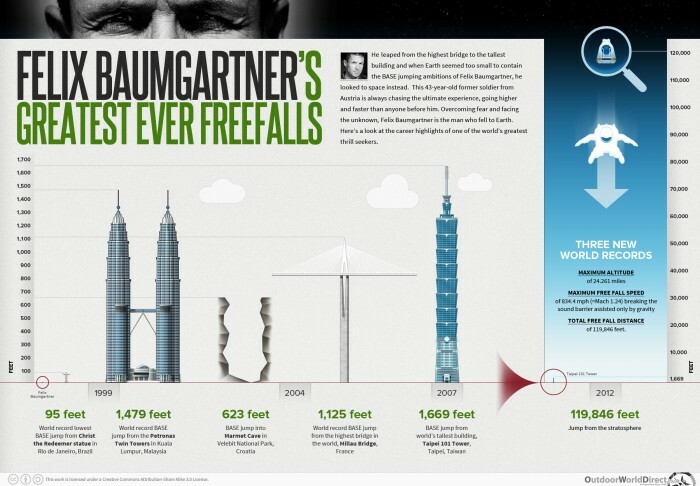 The info graphic compared the height to the statue of Christ the Redeemer, to the Petronas towers and a couple of other buildings finally comparing it to the stratosphere. A definite fun read.